Massive hemoptysis (over 200 ml at one go or over 500 ml in twenty-four hours) is considered as a serious case [1,2]. If the blood cannot be expectorated out from bronchus, sludged blood will form and obstruct the bronchus in a matter of a few minutes. Then an acute respiratory failure would be the immediate result, which might lead to a critical state or death of the patient. The most effective method to rescue patient is to suction off the sludged blood with a bronchoscope. But bronchoscopy normally is unable to draw-off the sludged blood from the bronchus because of the strong adhesive power of the sludged blood. However, cryotherapy under bronchoscopy may make sludged blood temperature cool below zero and become solid and then take out the sludged blood from the bronchus in a short time and rescue patient. RICU of a university teaching hospital. Single case, a patient with type1 diabetes for four years, complicated with severe acidosis, and in critical condition. Hemoptysis occurred during artificial dialysis and sludged blood obstructed the right main bronchus completely. The acute respiratory failure couldn't be retrieved by respirator under 100% FiO2. Bronchoscopy suction was taken through tracheal intubation and assisted with cryotherapy through bronchoscopy while continuous mechanical ventilation was running, her respiration was kept stably. Emergency removal of the sludged blood from the right main bronchus of the patient with cryotherapy through bronchoscopy aided by mechanical ventilation was carried out rapidly her air way was re-opened again. At last, the patient was rescued from respiratory failure and recovered. X-ray and CT scan displayed that the right lung of the patient was clear from consolidation in whole (Figure 1). Meanwhile, her type 1 diabetes and severe ketoacidosis were recuperating with the other measures. To remove blood clot from bronchus with cryotherapy under flexible bronchoscopy is a more effective and simple method to rescue patients with critical acute respiratory failure caused by blood clot obstruction than using biopsy forceps jaws (Figure 2). Massive hemoptysis is a critical emergent state for patients. If the blood remains static in bronchus for several minutes, it would form sludged blood and obstruct the bronchus. Should this happen, most patients would suffer from acute respiratory failure, and sometimes the situation could be life-threatening. To eliminate the sludged blood from the bronchus quickly is a key step to save the situation. Many physicians thought that flexible or rigid bronchoscopy could help do the job [1,2], that cryotherapy under bronchoscopy can speed up the process of removing blood clot and bring the patient to safety. But there was little true report. Actually no one used the cryotherapy to rescue any patient with sludged blood obstructed main bronchus from former reports. This report displays a successful case rescue. A 19-year-old Chinese female with polydipsia, polyphagia, polyuria and weight loss for 4 years, lost consciousness one day and was admitted to our hospital at 7:00 pm on Jan 5, 2013. She has suffered from type1diabetes for four years and has been stopped injecting insulin for nearly 10 days. Physical examinations showed: T36.7 ℃, P140 times/min, R 36 times/min, BP110/72 mmHg; confusion of consciousness, little response, no abnormal lung sign, fasting plasma glucose 20.1 mmol/L, urine glucose+++, Ketone+++. Blood gas analysis results were as follows: pH 6.82, HCO3- < 3.0 mmol/L, PaO2 147 mmHg, PaCO2 12 mmHg. 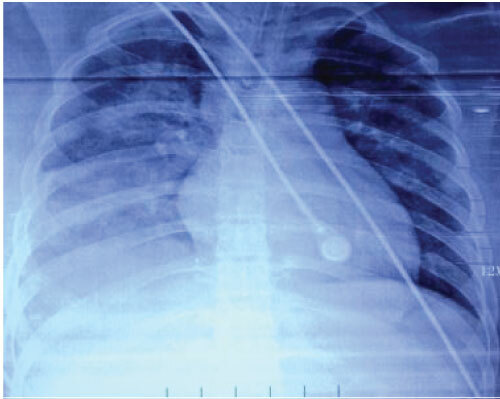 Chest X-ray revealed right lower pneumonia (Figure 3). She was immediately given urgent insulin hypoglycemic, and measures were taken to correct acidosis. Anti-infection medicine was also administered. But there was no telling effect and acidosis correction failed. At 9:00 pm, blood gas analysis results were: pH 6.993, HCO3- < 8.8 mmol/L, PaO2 141 mmHg, PaCO2 38.2 mmHg. From 9:20 to 9:40 pm, her respiratory and cardiac arrests occurred twice but she was pulled out successfully by successful cardiopulmonary resuscitation (CPR). Then acute respiratory failure happened once again quickly. Mechanical ventilation and tracheal intubation had to be applied to support her respiration and artificial dialysis to correct acidosis. After 30 min, blood gas analysis results showed: absorbing Oxygen FiO2 100%: pH 7.525, HCO3- 28.1 mmol/L, PaO2 55.7 mmHg, PaCO2 34.3 mmHg. Coagulation system parameter detected abnormal for TT39.6 s, APTT87.5 s. Oxygen saturation fell suddenly because of the right Lung hemorrhage, and physical examination showed real percussion sounds in the right lung and breath sounds disappeared. The pressure of artery oxygen fell to 30.4 mmHg under FiO2 100%, PaCO2 34.3 mmHg. Chest X-ray revealed complete atelectasis of the right lung. Urgent bronchoscopy through intubation found the right lung obstructed completely by blood clot. Biopsy forceps pressed from both sides but just removed a little clot and didn't relieve the obstruction in the right main bronchus. In the case of ventilator support ventilation, we used bronchoscopy inserting bronchus for three attempts and inserted the frozen probe (Produced by Erbo corporation, German) through the work hole of bronchoscope. Then we turned on the cryotherapy device and made the temperature lowed to -80 degrees centigrade below zero and made blood clot ice up in order to remove frozen blood clots completely. It is possible to remove the blood clots in whole through freezing, and greatly speed up the saving process of patients whose brochures were obstructed by soft blood clot. In the process of taking blood clots, SaO2 was as low as 70% and heart rate was decreased to 50 beats per min or slower. 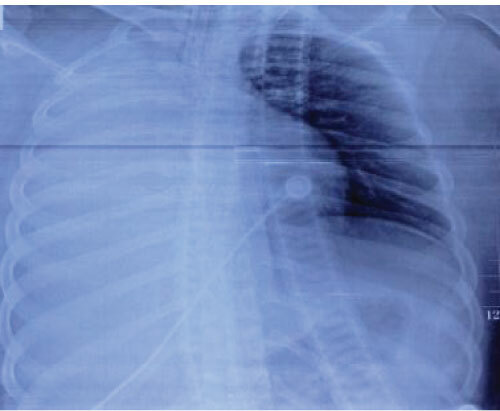 The broncho scope was withdrawn immediately and respirator was connected with intubation to keep ventilation on until SaO2 recovered to above 90% and heart rates picked up to more than 60 times a minute. After that, the operation for taking out the blood clots was repeated many times until blood clots were totally removed and the respiratory failure was corrected completely. With such treatment, her blood sugar returned to normal and her ketoacidosis was corrected completely. Then she was discharged from our hospital. Massive hemorrhage is an emergent and fatal condition for patients. Although massive hemoptysis accounts for only 5-15% of the episodes, it should always be considered as a life-threatening condition that warrants effective assessment and management . If either the right or left main bronchus was obstructed by blood clot completely, the right main bronchus in particular, most patients would suffer from respiratory failure. Sometimes it is in life-threatening. This female patient in question was in critical state because of her serious type 1 diabetes and ketoacidosis. The very low pH manifested her critical state and that the repeated respiratory and cardiac arrests indicated she could die at any time. After received bedside artificial dialysis, she hemorrhaged in her right lung and the blood clot obstructed her right lung bronchus completely, resulting in the immediate acute respiratory failure, although ventilator maintained her respiration with 100% FiO2. The biopsy forceps jaws under bronchoscopy just remove little blood clots because of the softness of the blood clot, and couldn't unblock the right main bronchus, though the respiratory failure was relieved at certain extent. Then with ventilator support, cryotherapy through bronchoscopy, the frozen blood clots were removed completely in 3 attempts. Hardening by freezing made is possible to remove the blood clots in whole, greatly sped up clearing the right main bronchus obstructed by blood clot. Thus, we cured the patient with acute respiratory failure. During the process of removing the blood clots, SaO2 was as low as 70% and heart rate was at 50 beats per min or slower, Then the bronchoscope was withdrawn immediately, and respirator was connected with intubation to keep ventilation on until SaO2 recovered to above 90% and heart rates picked up to more than 60 times a minute. Only then, the operation repeated until the blood clots were completely removed and the respiratory failure corrected. Severe hypoxemia and heart rate decrease are extremely high risks during the process of removing the blood clots with emergency bronchoscopy, and it requires the operator to be extremely delicate, steady in action. Any carelessness would cause cardiac arrest and result in operation failure. After necessary consolidation treatment to have the normal blood sugar restored and ketoacidosis completely corrected, the patient can be discharged. Erik Folch, et al. reported either flexible or rigid bronchoscopy could be used while maintaining a protected airway [2,3], especially, in trachea or main bronchus with an acute or chronic obstruction, including blood clot type. But rigid bronchoscopy operation is more difficult than flexible one and also more dangerous, especially in patient with emergent and critical acute respiratory failure. As a matter of fact, flexible bronchoscopy operation for critical acute respiratory failure caused by blood clot obstruction can also be very dangerous. To remove blood clot from bronchus with cryotherapy under flexible bronchoscopy is a very effective and simple way to rescue patients with critical acute respiratory failure caused by blood clot obstruction. It has obvious advantages over the biopsy forceps jaws, but well trained and skillful operators are required to carry out the operation. En-Qing Fu collected clinical information, designed and performed the operation, and wrote the manuscript. Yan Wang was nurse and aided to finish the operation. We give our sincere thanks to the patient and her family members for their support to our study and their consent to the publication of this case report. Folch E, Mehta AC (2008) Airway interventions in the tracheobronchial tree. Semin Respir Crit Care Med 29: 441-452. Karmy-Jones R, Cuschieri J, Vallières E (2001) Role of bronchoscopy in massive hemoptysis. Chest Surg Clin N Am 11: 873-906. Sakr L, Dutau H (2010) Massive hemoptysis: An update on the role of bronchoscopy in diagnosis and management. Respiration 80: 38-58. 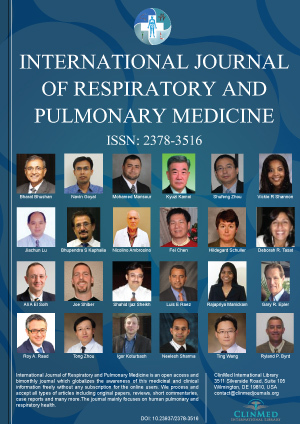 Enqing Fu, Department of Respiratory and Critical Medicine, Tangdu Hospital, The Fourth Military Medical University, Xi'an 710038, China, Tel: +86-029-84777825; +86-13759975103. © 2018 Fu E, et al. This is an open-access article distributed under the terms of the Creative Commons Attribution License, which permits unrestricted use, distribution, and reproduction in any medium, provided the original author and source are credited.